Perhaps Porsche's most important launch this year will be the introduction of the new third-generation Cayenne SUV, arriving on the roads next month. Ahead of first deliveries, Porsche has confirmed an E-Hybrid model will soon follow petrol-powered cars into showrooms. Porsche has revealed that it is "on the cusp" of releasing the plug-in hybrid Cayenne, with final sign off tests taking place in South Africa right now. Final figures have yet to be revealed, but expect an all-electric range of around 50 kilometres and a powertrain consisting of the base Cayenne's 335bhp turbo V6 combined with a 100kW electric motor and a 14kWh battery pack. Purists sneered at the original Cayenne when it first arrived in 2003, but the Mk3, revealed last year at the Frankfurt Motor Show, promises to be closer in spirit to the company's sports cars than ever. The Cayenne's styling cues are a mix of traditional Porsche details with elements of the Macan and recently launched Panamera in its design. The headlights are an evolution of the last Cayenne, while matrix beam LED headlights are just one of the hi-tech additions to the car. There's a wide grille set underneath, while an increase in dimensions means the Cayenne has greater road presence than before. The Cayenne sits on the VW Group's MLB platform that is also used for the Audi Q7 and Bentley Bentayga, although Porsche will have completely reworked the layout for its own purposes. 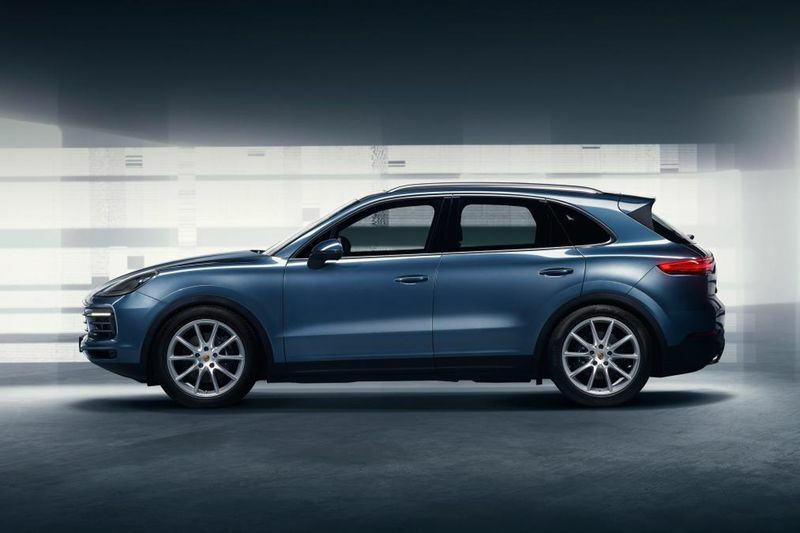 The Cayenne has the same wheelbase as the Mk2, but the car's overall length increases by 63mm and the roof is 9mm lower. Coupled with the increased use of horizontal lines at the front end, this gives the Cayenne a slightly wider-looking stance. The car's profile is largely similar, although the marginally longer rear overhang boosts boot space by 100 litres, with 770 litres on offer in five-seat mode. Inside, the Cayenne uses a dashboard that's similar to the one found in the Panamera. There's a large centre console as before, although it's far tidier thanks to the 12.3-inch touchscreen system now used. Like the Q7 and Bentayga, the Cayenne gets access to 48-volt electrics, and this means Porsche is able to offer an active anti-roll bar set-up on the options list to boost the Cayenne's handling. There will only be two versions of Cayenne at launch, the Cayenne and Cayenne S. The first uses a 3.0-litre turbocharged V6 petrol that makes 335bhp and 450Nm of torque. This is enough to take the car from 0-62mph in 6.2 seconds and on to a maximum speed of 152mph. The Cayenne S gets a 2.9-litre twin-turbo V6 with 434bhp and 550Nm. This model can manage 0-62mph in 5.2 seconds (or 4.9 seconds if you add the Porsche Sport Chrono option with launch control) and a 266 kilometres per hour top speed. In time, Porsche will launch faster GTS, Turbo and Turbo S petrol models, with the plug-in E-Hybrid now just around the corner. a Cayenne diesel is promised at some stage in the vehicle's lifespan too.